Ten is now the average age when children receive their first cell phones, and those phones quickly find their way into classrooms. 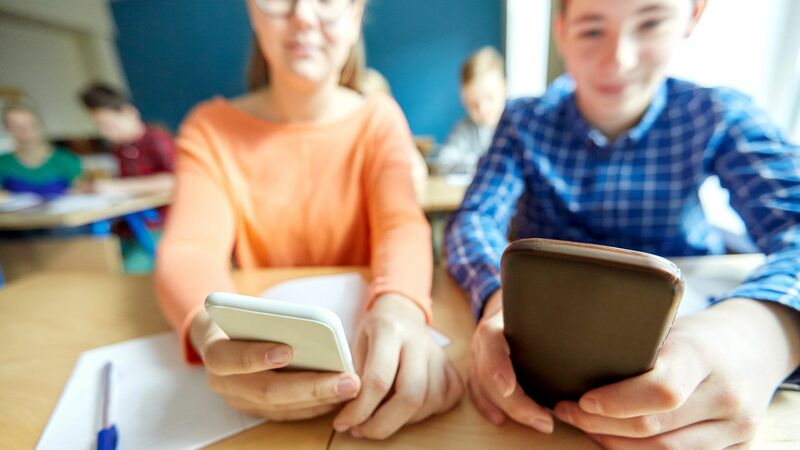 While cell phones have extraordinary potential for leveraging learning, they can quickly become a hindrance in the classroom, diverting attention away from learning. How can teachers harness the learning potential of students’ phones while also keeping them from being a distraction? I have learned that rather than trying to be reactive, the best defense when it comes to cell phones is a well-planned offense. Teachers who implement a proactive management plan developed in collaboration with the students at the beginning of the school year may have fewer issues as student cell phone ownership increases throughout the year. The first few weeks of the school year often focus on creating classroom routines, and thus are a perfect time to set up cell phone expectations. Teachers can help their students develop a positive mobile mental health in the first weeks of school by discussing their ideas on cell phone use, setting up a stoplight management system, and establishing a class contract. Part of teaching digital citizenship is knowing where your students are in their understanding of privacy, safety, etiquette, identity, empathy, and security online. Build a digital citizenship curriculum that includes mobile device use. Talk to your students about their cell phone use (and share your own experiences). You may be surprised at how little they have these conversations with adults. Post a red button on the classroom door: Students know when they enter that cell phones should be put in their off location. The devices will not be used that day. The teacher should decide on the off location—the upper right-hand corner of the desk and turned face down, or away in backpacks, or in pocket holders on the teacher’s desk—the cell phone parking lot. Post a yellow button on the classroom door: Students know their cell phones should be on silent (vibrate) and placed face down in the upper right-hand corner of their desk. They will be using them in class, but not the whole time. Having the phones in plain sight—a bit out of reach and turned over—allows the teacher to easily scan the room to see who doesn’t have their device where it should be. It also makes it difficult for students to quickly peek at their text messages because they’d have to turn the phone over and move it from its correct position—which is more difficult than when cell phones are hidden under desks. Post a green button on the classroom door: Students know they should have their phones turned on (either silenced or set on vibrate) and placed face up in ready position to use throughout the class. Ask your students to help you develop social norms for what is and is not appropriate cell phone use during green and yellow button times. Should they be allowed to go on their social media networks during class? Why or why not? Talk to them about what to do with their devices in different social scenarios in the classroom. Ask them to brainstorm consequences and write them into a class contract. Send the contract home for parents to read and sign with their children, so everyone is on the same page. After a couple of months, revisit the contract with your students to see if any amendments are needed. If you take the time in the first week of school to establish a management system and a social contract and to open up dialogue about student cell phone use, expectations are clear. As more cell phones enter the classroom throughout the year, the students immediately know where to place them and when and how they can use them. In addition, the community is focused on a safe, healthy use of cell phones, rather than being distracted by them.